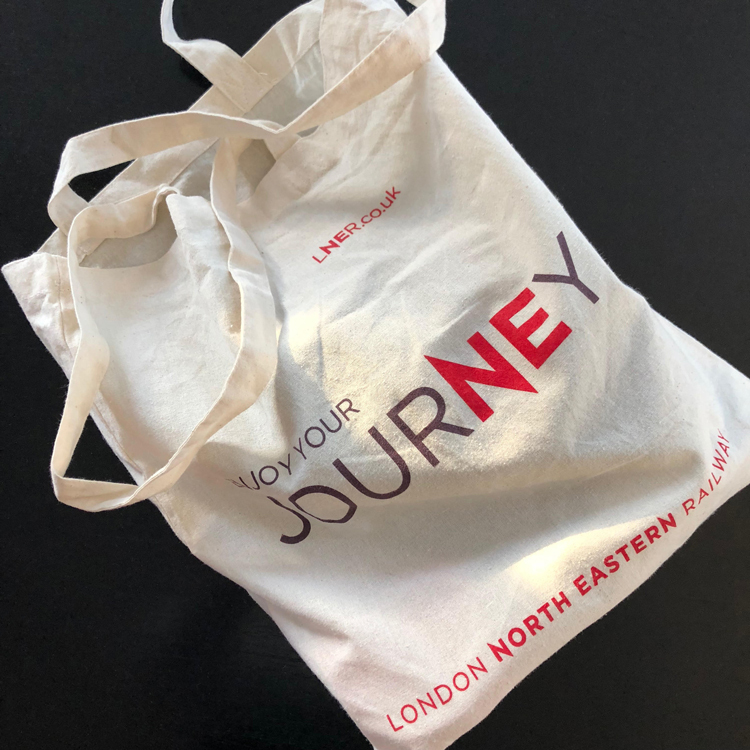 Virgin Trains East Coast (VTEC) has been rebranded as London and North Eastern Railway (LNER), following the collapse of the private franchise. VTEC, now LNER, is a trainline which runs from London to Edinburgh to Inverness. It was operated by private companies Virgin and Stagecoach, but the companies could not meet their promised payments in their contract, allegedly caused by lower passenger numbers and revenue than was forecast, according to The Guardian. The trainline has now been temporarily renationalised and will be run by the Department for Transport. 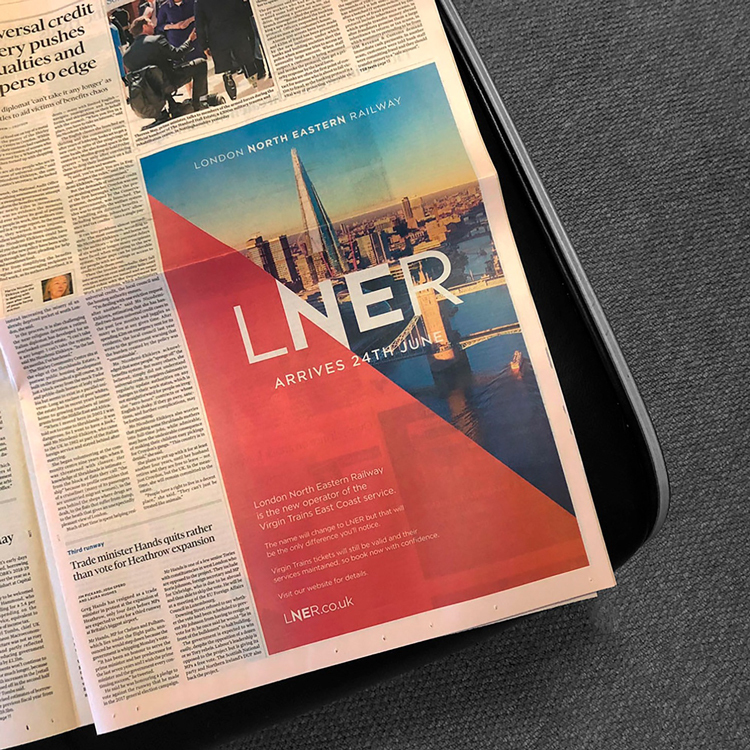 The Government department commissioned design studio BrandCooke to rebrand the company as LNER, which is a return to the original name used by the trainline nearly 100 years ago. BrandCooke created a new identity for the trainline, which distinguishes it from the VTEC brand but keeps some design elements of it such as colour palette so that existing train livery and interiors do not need to be dramatically changed, says Gary Cooke, founder at the design studio. 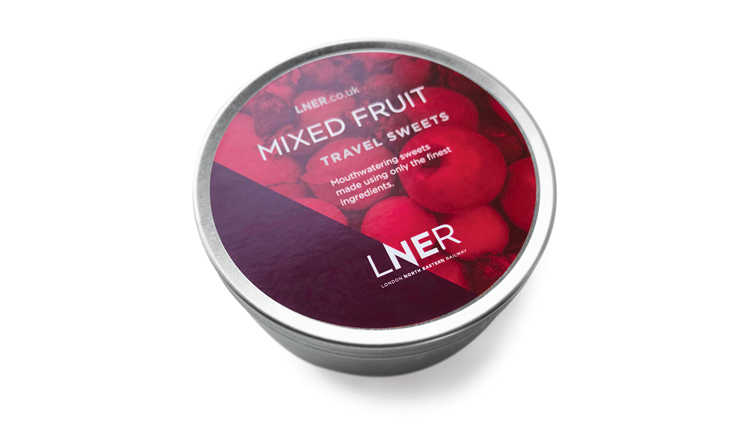 The new brand includes a red and white colour palette &- reminiscent of Virgin Trains &- used alongside the name LNER set in a sans-serif typeface, which is a bespoke version of Gotham. The “N” has been elongated and given sharper points, and is used as a diagonal dividing device for colour, imagery and text. Cooke says that the studio steered away from designing something with a “nostalgic, retro feel” that “railway aficionados may have loved” but would have been too similar to the First Great Western trainline rebrand to GWR completed in 2015 by Pentagram partner John Rushworth. He adds that the “N” symbol in the new logo has a “directional” quality to it, which “subconsciously” harps back to the British Rail logo, designed by Gerry Barney in 1964. The diagonal symbol is also used in the top right corner of posters and adverts, to further symbolise the North East. The rebrand comes a few months before a new fleet of high-speed trains called the Azuma fleet are due to launch on LNER in December 2018, having launched on Great Western Railway (GWR) last year. 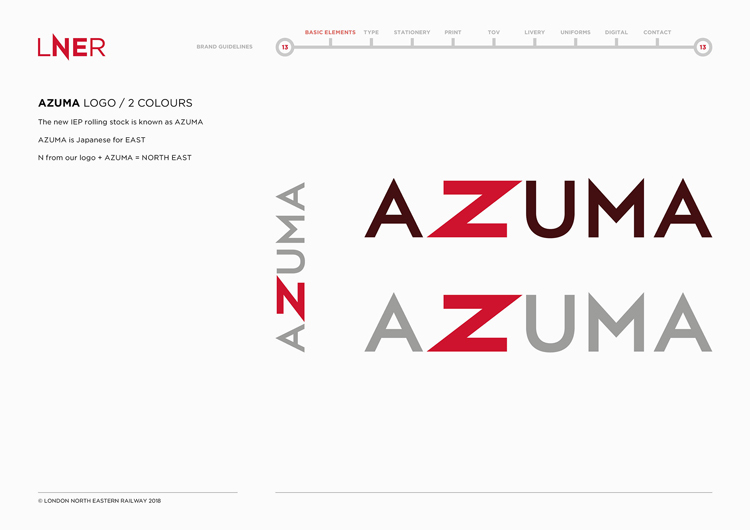 The Azuma trains were created and marketed under Virgin Trains, so Cooke has kept the name but integrated the pointed style of the new “N” into the “Z” in Azuma. 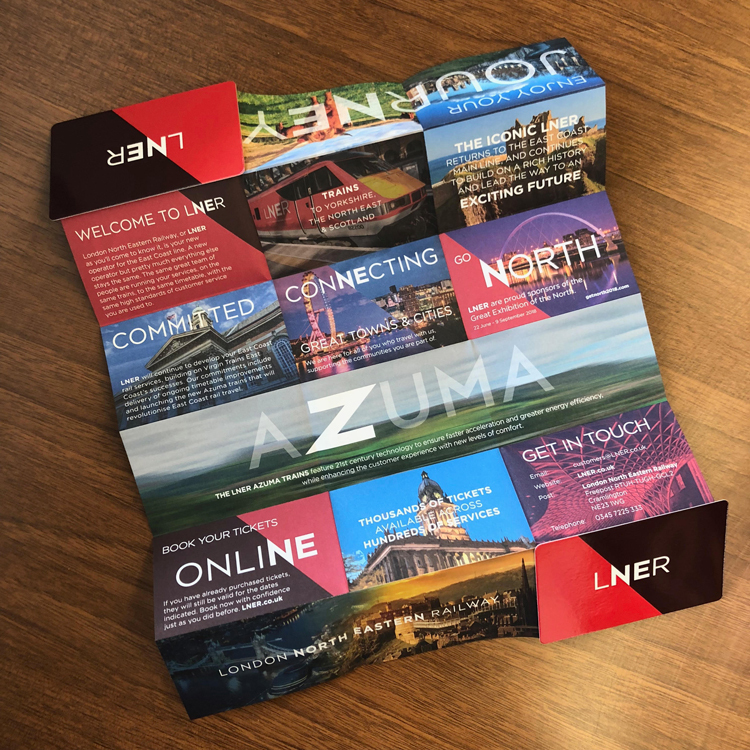 “Azuma is Japanese for East and by integrating the letter ‘N’ from LNER to form the letter ‘Z’ in Azuma, the logo spells out North East,” he says. Stock photography has been used of various destinations. There was no time to commission illustrators and photographers due to the short time-span of the project, but this is something that could be pursued in the future, says Cooke, given the graphic design history of the original LNER, which featured illustrative posters between the 1920s and 1940s. 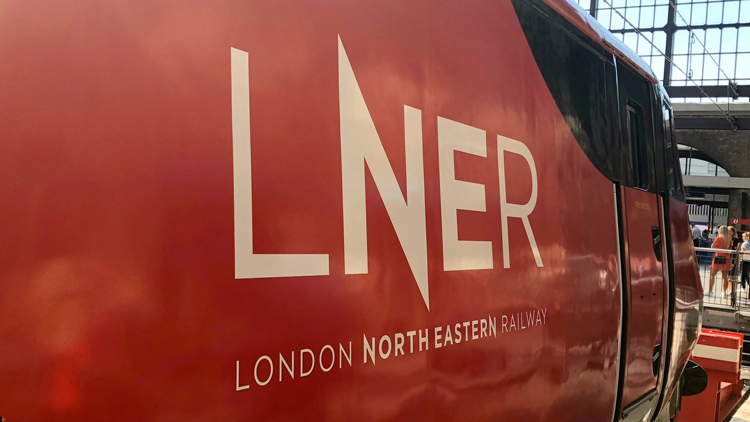 The brand guidelines have now been passed on to the in-house design team at LNER based in York, which will develop the brand with hopes to commission illustrators. The new brand has now rolled out across station signage and advertising, such as at London’s King’s Cross and York stations, on marketing and print materials, digital platforms and merchandise. It is currently rolling out on train livery, but will launch in full on livery when the Azuma trains are launched later in 2018. The post Virgin Trains East Coast rebrands as London North Eastern Railway appeared first on Design Week.